On the way to our wedding one very hot June afternoon, driving through our country lane, we saw three tiny kittens beneath a Mimosa tree. We spent the next two nights into the early hours attempting to rescue them from the ravages of the summer heat and other dangers. The kittens had been dumped on the lane and survived for several days eating bugs. We managed to catch two of them; they were no larger than the palm of my hand. Mimosa - Mim for short - is a red point, aptly named for the tree we found him under. He is regal, loving, and intelligent. The other, a seal point, we named Juno, since the asteroid Juno was overhead that night. And before we realized it we had an addition to the family - Miss Maggie. She has the same blue eyes and the color markings of both parents. We named her Maggie because when her Mom chattered to her it sounded like Marg Simpson calling 'Maggie'. They are still a family, and in that family they include my husband and I. We adore our entertaining cats! Welcome Judith! I love this story, and such very pretty kitties. I'm glad you managed to rescue the two little ones - it's not an easy task to feed and raise orphan kittens like these, so you did well to keep them both alive. But very rewarding to watch kittens you've rescued like this get bigger and turn into full-grown cats. How surprised you must have been when Miss Maggie arrived! She's gorgeous and it's fascinating to see how the colors of her two parents mix and mingle to create hers. 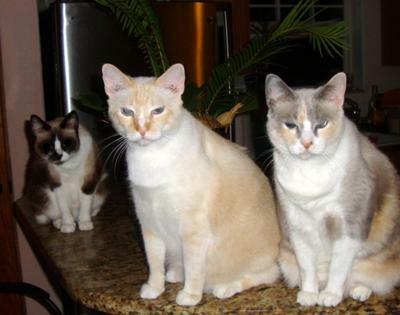 They are all beautiful - Juno and Miss Maggie look a lot like Snowshoe Siamese with their white paws and facial markings. I am so glad you found the special gifts that God placed for you to find on your wedding day. And I am happy to hear that you enjoyed the extra gift that came with them you didn't know about. She is very beautiful! I am so happy that you decided to expect and keep his special gifts for yourselves; I do hope you realize that they were a gift to the two of you and the baby was for the both of you. I hope you have a long and happy marriage together, and when things seem a little difficult just look at those kitties and they will make every thing seem right again! Just remember they are gifts from God that were sent to you! Best wedding present, I´ll bet!